Hello friends! Hope this Friday finds you happy, if for no other reason, just for the pure factor, that Saturday is only ONE day away....hehehe.... But, I am sure you find happiness in other things, too. For me, simple things make happy, like the sun shining on a pretty flower, or a tree, in fact as I am typing this, the sun is shining on a tree I see from my window and the leaves are just beautiful. LOVE that!!! Anyway, there are quite a few things I am happy about today. One is that my sweet friend Karen is celebrating her Official Birthday TODAY!!!! Even though each of us on the Ippity team made a card for her yesterday, I made another card in honor of her Birthday for my post today as well. Happy Official Birthday my friend!!! And the other thing I am super happy about is that Samantha Walker was looking for a few designers to help her promote her products, which I already happily use, and she invited me to be on her team. So from now on, you will see me combining her products in with more of my posts. I am so excited about this, as I do already love her products, so joining her was a very easy decision. I am excited to see who the other girls are on her team, as for now I only know one other person, who is on the team..hehehe...so let's all run over to Samantha's blog and check out who were the other lucky chosen ladies to make it on her team! As you may recall a few weeks ago I guest designed for Samantha and used her Encompassed Grace stamp set as one of the stamp sets to design with. I just love this set so much, the frames are absolutely GORGEOUS and so easy to work with. You can easily make a very elegant or playful card with it. Samantha not only designs stamps with Unity Stamps, but she also designs Silhouette Digital cutting files, and as you know, I LOVE my Silhouette, so I own quite a lot of her cutting files, too...hehehe...what can I say? I just love pretty things. So the card shape actually is one of her cutting files, too. It's called the "artisans nesting rectangular", if you would like to own it. 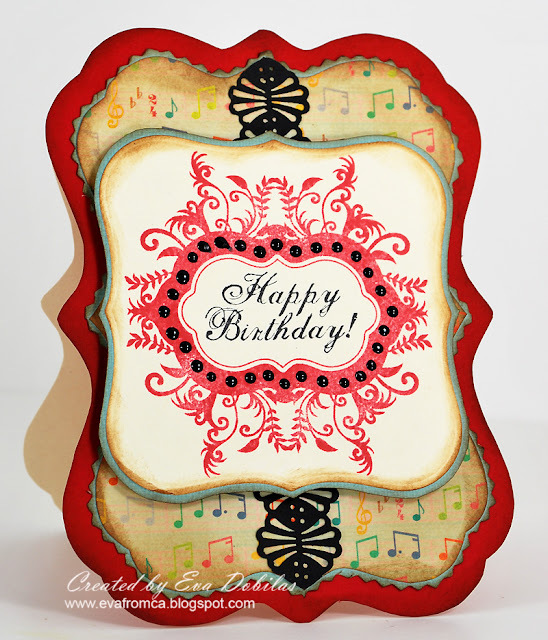 I also used Spellbinder Label One, because it went with my design, so I just cut that shape. My papers are by Sassafrass, the Indie Girl, I'd say perfect for a Birthday card, isn't it? I just love it. Ohh and how do you like those little dots around the frame? They are Ranger's Black Enamel Accents I picked up at Michael's with a nice coupon and I was inspired by the BEAUTIFUL SANKARI, as she uses their Liquid Pearls all the time, and I just ADORE everything she makes ! Another thing is that a few weeks ago I was at a crop and there was a sweet lady who showed Karen and I how to create that punched border you can see on my card today. Well, yesterday I finally figured out how to record a video of me, so I am going to show you, how you can do it very easy AND very soon!!! Does that make you HAPPY, too???? Well, that is it from me today, and wishing you a lovely Friday.